The primary purposes of this renovation project was to provide renovation of the 3rd floor north wing of building 154 into a G.I. suite. Renovations were made to provide procedure, exam, consultation, office, and reception space. The new suite included an endoscopy treatment room, cystoscopy treatment room, exam rooms, office/consult rooms, clean and soiled storage rooms, reception/clerk’s office, and a waiting room. The existing ICU suite and associated exam rooms and offices comprised approximately 2000 SF of space to be renovated. Specialized equipment relating to the furnishing of the procedure rooms was procured and installed as part of the project. 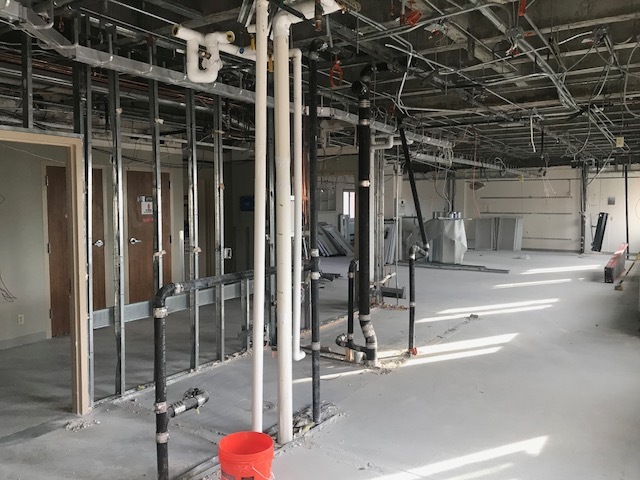 Work included demolition and construction including carpentry, finishes, floors, ceilings, fire sprinkler system, electrical, mechanical systems (plumbing and HVAC). All work was performed in an active hospital setting. Due to the sensitive location of the work being performed, clean work practices with infection control measures to include dust barriers and use of negative air equipment with HEPA filtration was utilized.